Fengguo Temple (奉国寺) is a Buddhist temple located in Yixian County, Jinzhou City, Liaoning Province. The temple was founded in 1020 during the Liao Regime (915-1125). It is one of China's three Liao temples. The most important surviving building is Daxiongbao Hall, featuring the oldest and largest coloful clay sculpture group in the world. Today, Fengguo Temple covers an area of over 50,000 square meters and two halls, two gates, a decorative arch have survived, along with some culture relics. Daxiongbao Hall features the architectural style of the Liao Dynasty. 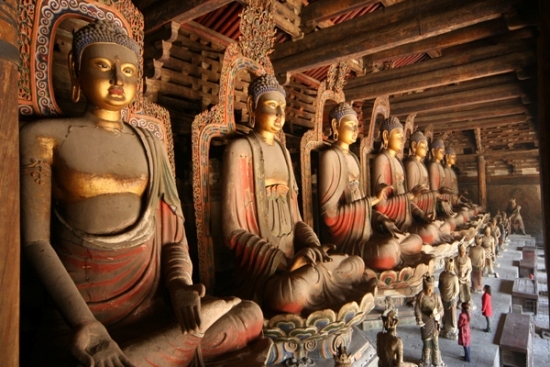 It contains seven large sculptures of the historical Buddha, which is not often found in Buddhist temples. Daxiongbao Hall is the earliest example of a Chinese building that uses bracket sets in between columns instead of simple struts. - Hours: 8 a.m. - 4:30 p.m.
- How to get there: take a bus at Dan Dong (costs 16 yuan).